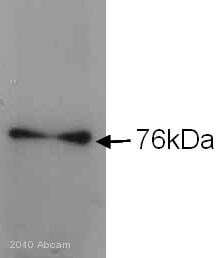 This antibody reacts with all known forms of the 74,000 Dalton intermediate chain subunit (IC74) of mammalian cytoplasmic dynein. 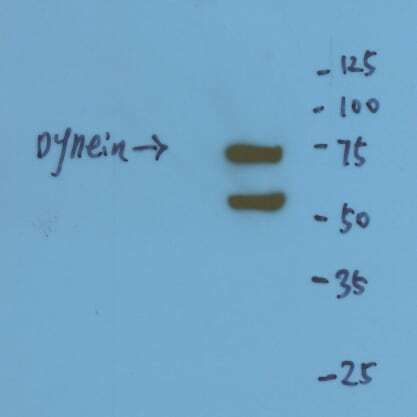 The antibody will cleanly immunoprecipitate the entire dynein complex from TX-100 or NP-40 lysates (including the 530 kD heavy chain, the light intermediate chains, and the light chains) from various tissues and cultured cell lines. If detergents such as SDS are used to prepare lysates the only dynein subunits which are immunoprecipitated are the IC74 subunits (presumably because the dynein complex dissociates). Full length native protein (purified) corresponding to Cow Cytoplasmic Dynein Intermediate chain. HeLa cell lysate for Western blot. Our Abpromise guarantee covers the use of ab23905 in the following tested applications. WB Use a concentration of 1 µg/ml. Detects a band of approximately 74 kDa (predicted molecular weight: 73 kDa). Belongs to the dynein intermediate chain family. Cytoplasm. Chromosome, centromere, kinetochore. Cytoplasm, cytoskeleton, spindle pole. 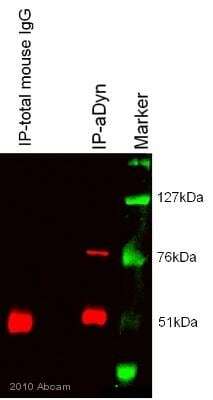 Immunofluorescent analysis of Dynein in U87-MG Cells. Cells were grown on chamber slides and fixed with formaldehyde prior to staining. Cells were probed without (control) or with a Dynein monoclonal antibody (Proab23905) at a dilution of 1:20 overnight at 4oC, washed with PBS and incubated with a DyLight-488 conjugated secondary antibody. Dynein staining (green), F-Actin staining with Phalloidin (red) and nuclei with DAPI (blue) is shown. Images were taken at 60X magnification. Immunofluorescent analysis of Dynein in C6 Cells. Cells were grown on chamber slides and fixed with formaldehyde prior to staining. Cells were probed without (control) or with a Dynein monoclonal antibody (ab23905) at a dilution of 1:20 overnight at 4oC, washed with PBS and incubated with a DyLight-488 conjugated secondary antibody. Dynein staining (green), F-Actin staining with Phalloidin (red) and nuclei with DAPI (blue) is shown. Images were taken at 60X magnification. Immunofluorescent analysis of Dynein in HeLa Cells. Cells were grown on chamber slides and fixed with formaldehyde prior to staining. Cells were probed without (control) or with a Dynein monoclonal antibody (ab23905) at a dilution of 1:20 overnight at 4 oC, washed with PBS and incubated with a DyLight-488 conjugated secondary antibody. Dynein staining (green), F-Actin staining with Phalloidin (red) and nuclei with DAPI (blue) is shown. Images were taken at 60X magnification. Flow cytometry analysis of Dynein intermediate chain 1 showing positive staining in the cytoplasm of U87-MG cells compared to an isotype control (blue). Cells were harvested and adjusted to a concentration of 1-5x10^6 cells/ml. Cells were then fixed with 2% paraformaldehyde and washed with PBS. Cells were penetrated by dropping the supernatant and adding 90% methanol followed by incubation for 10 minutes at room temperature. Cells were blocked with a 2% solution of BSA-PBS for 30 min at room temperature and incubated with ab23905 at 2 ug/test for 60 min at room temperature. Cells were then incubated for 40 min at room temperature in the dark using a Dylight 488-conjugated goat anti-mouse IgG (H+L) secondary antibody and re-suspended in PBS for FACS analysis. Flow cytometry analysis of Dynein intermediate chain 1 showing strong positive staining in the cytoplasm of Hela cells compared to an isotype control (blue). Cells were harvested and adjusted to a concentration of 1-5x10^6 cells/ml. Cells were then fixed with 2% paraformaldehyde and washed with PBS. Cells were penetrated by dropping the supernatant and adding 90% methanol followed by incubation for 10 minutes at room temperature. Cells were blocked with a 2% solution of BSA-PBS for 30 min at room temperature and incubated with ab23905 at 2 ug/test for 60 min at room temperature. Cells were then incubated for 40 min at room temperature in the dark using a Dylight 488-conjugated goat anti-mouse IgG (H+L) secondary antibody and re-suspended in PBS for FACS analysis. Flow cytometry analysis of Dynein intermediate chain 1 showing positive staining in the cytoplasm of C6 cells compared to an isotype control (blue). Cells were harvested and adjusted to a concentration of 1-5x10^6 cells/ml. Cells were then fixed with 2% paraformaldehyde and washed with PBS. Cells were penetrated by dropping the supernatant and adding 90% methanol followed by incubation for 10 minutes at room temperature. Cells were blocked with a 2% solution of BSA-PBS for 30 min at room temperature and incubated with ab23905 at 1 ug/test for 60 min at room temperature. Cells were then incubated for 40 min at room temperature in the dark using a Dylight 488-conjugated goat anti-mouse IgG (H+L) secondary antibody and re-suspended in PBS for FACS analysis. 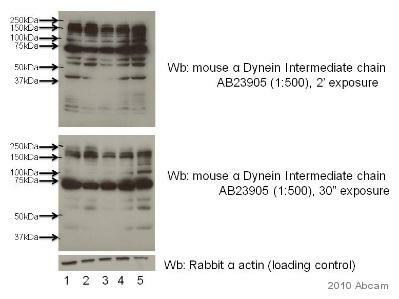 Western blot detection of Dynein intermediate chain 1 in HeLa cell lysate using ab23905. Overlay histogram showing DU145 cells stained with ab23905 (red line). The cells were fixed with 100% methanol (5 min) and then permeabilized with 0.1% PBS-Tween for 20 min. The cells were then incubated in 1x PBS / 10% normal goat serum / 0.3M glycine to block non-specific protein-protein interactions followed by the antibody (ab23905, 1µg/1x106 cells ) for 30 min at 22°C. The secondary antibody used was DyLight® 488 goat anti-mouse IgG (H+L) (ab96879) at 1/500 dilution for 30 min at 22°C. Isotype control antibody (black line) was mouse IgG2b [PLPV219] (ab91366, 2µg/1x106 cells) used under the same conditions. Acquisition of >5,000 events was performed. Publishing research using ab23905? Please let us know so that we can cite the reference in this datasheet.